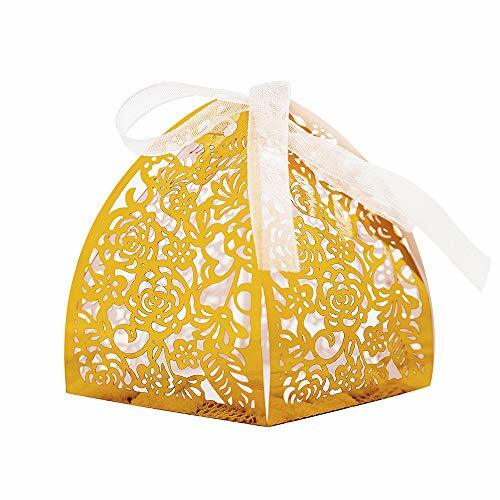 These elegant favor boxes are perfect for holding little goodies you wish to bestow on guests for special occasions. WHAT YOU GET:Each order is for one hundred (100) boxes. Measurements: Height: approx. 2" tall. Width: approx. 2" wide. Please Note: Boxes are shipped flat. Simple folding is required for assembly. Ribbon and other decorations are NOT included with this purchase.The decorating possibilities are endless. Top them off with colored ribbon or affix with personalized labels, stickers, or charms.Favor boxes are perfect for favors and bring a decorative touch to any place setting or favor table at any event, party, or trade shows.PLEASE NOTE: The colors of products when viewed on your computer monitor may appear different than the actual color of the merchandise. We make every attempt to give you a good representation of the available colors for each product sold, but unfortunately we cannot guarantee an exact match. Dye lot variance of 1 to 2 shades is considered normal. Occasion: Wedding, Baby Shower, Bridal Shower Seasons: Spring Wedding Favors, Summer Wedding Favors, Fall Wedding Favors, Winter & Christmas Favors Category: Favor Boxes Materials: Embossed Paper Color:as picture show Laser Cut: Laser-cut Personalization: Non-personalised Shipping Tips: Fill them with chocolates, Jordan almonds or whatever your heart desires.Ship flat and easily assembled, enjoy your DIY wedding favors. Boxes come flat packed and easily assembled. 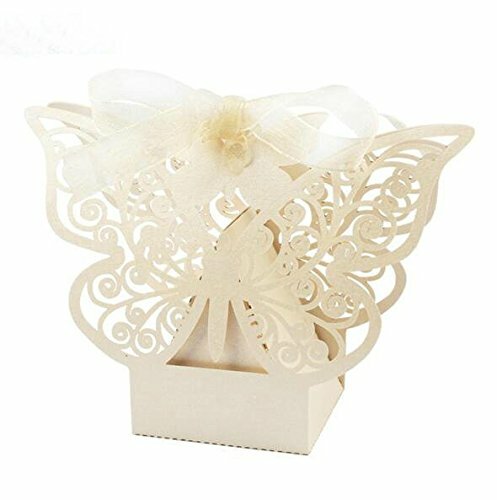 ✿Make your party no longer normal.✿KAZIPA 50pcs Laser Cut Favor Boxes, 2.6" x 2.6" x 1.6" Floral Favor Boxes✿Add more happiness in your life☺Features:Latest 3D Technology applies on decorative box, 3D butterfly and hot stamping surface makes the candy box more elegant and exquisite.All the box covers with floral pattern, ivory color seems more classic.Easy to fold, get more fun when you DIY with it. 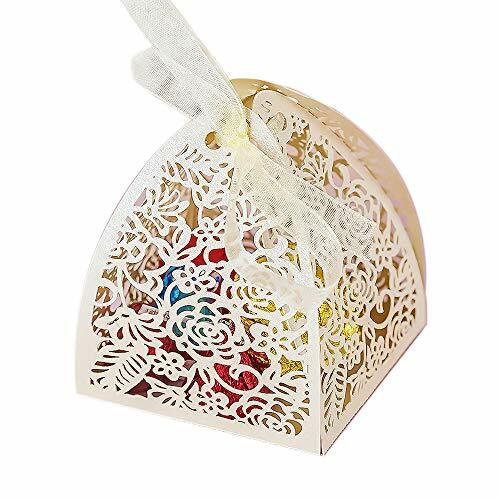 Makes your special moment more special!It could used as gift box, candy box, favor box and even decorative box.Specification:Color: IvoryQuantity: 50 pc Size: 2.6" x 2.6" x 1.6" /6.6cm x 6.6cm x 4.1cm Capacity: 4 macarons, 2 Ferrero Rocher, or 5-8 Dove chocolates. Occasions: Garden Theme☑Classic Theme☑Romantic Theme☑Party☑Wedding☑Birthday☑Bridal Shower☑Baby Shower ☑Anniversary ☑Note: Note: Due to the difference between different monitors, the picture may not reflect the actual color of the item. 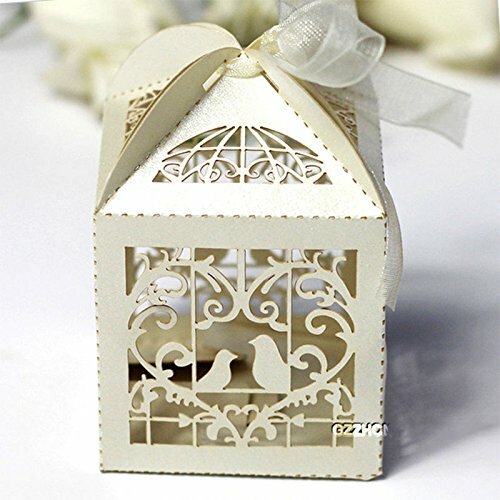 These elegant favor boxes are perfect for holding little goodies you wish to bestow on guests for special occasions. WHAT YOU GET:Each box measures 2"x2"x2". Each 1 x quantity is for 100 total boxes.These favor boxes are shipped flat. 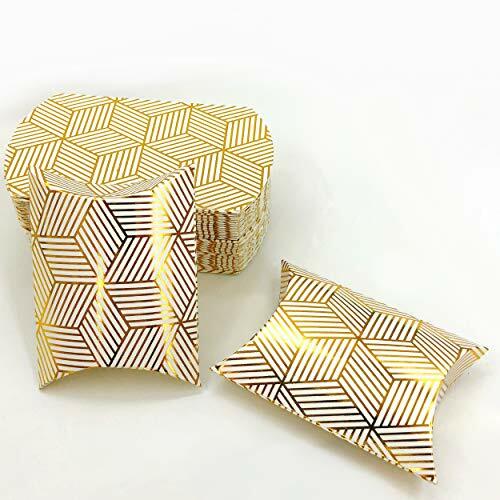 Simple folding is required for assembly.Ribbon and other decorations are not included with this purchase.The boxes packed by 100 and unfortunately we do not sell them in any lesser quantities than that.The decorating possibilities are endless. 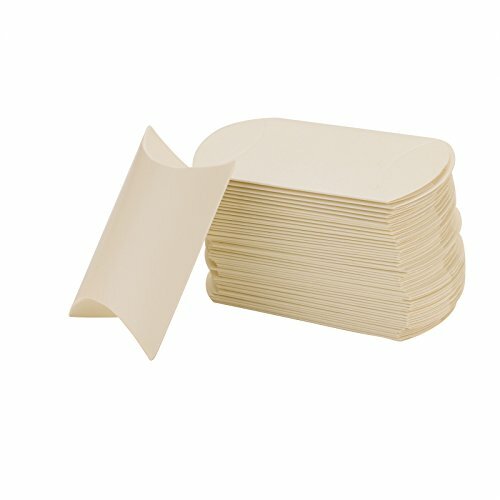 Top them off with colored ribbon or affix with personalized labels, stickers, or charms. Its classic design allows you to present your charming favors with grace. 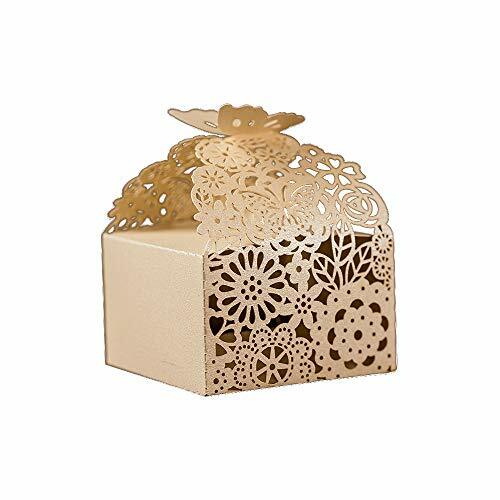 Favor boxes are perfect for favors and bring a decorative touch to any place setting or favor table at any event, party, or trade shows. You can also use them to give out to your guests as take home cake box. 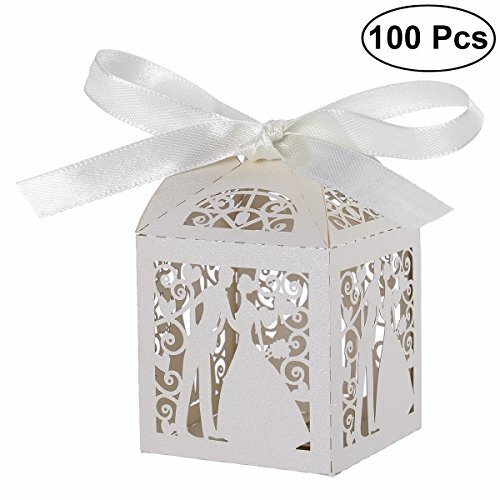 Pack of 25 2-piece favor boxes. Available in a wide selection of colors, you can mix or match. Look for the one that matches your event or theme. 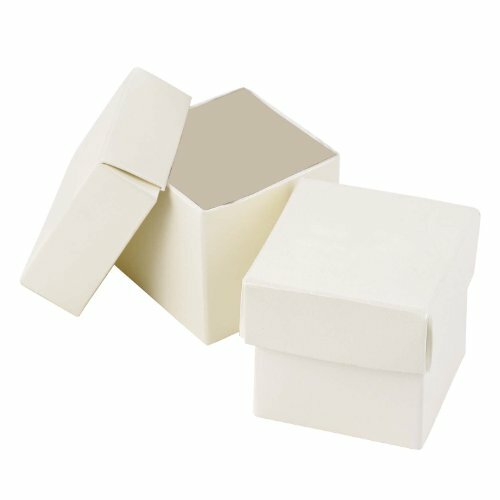 Boxes ship flat and are easy to put together to create a 2-inch cube. Use as a gift box for friends, wedding attendants, or guests. The best things come in small packages: jewels, a lucky coin, special memento, or tasty treats. Fill with matching color mints, almonds, jelly beans, or wrapped candy - turns even an inexpensive favor into a fancy treat. Pictured contents not included. Your event deserves the best - and the best comes from Hortense B. Hewitt, the leader in quality wedding accessories for more than 60 years. 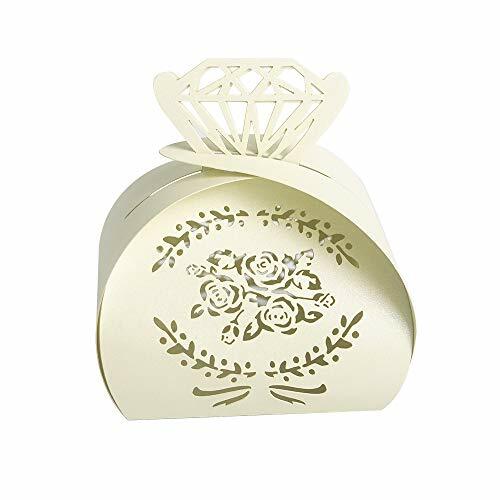 Delicate Cake Boxes with Glossy Outside Finish Measures: 4" x 4" x 2" Fill with your favorite candy to make a cute surprise box for your guests. Another use would be to give out to your guests as take home cake box. Item is for the boxes only, does not include ribbons or other decorations on picture. Boxes are shipped flat. 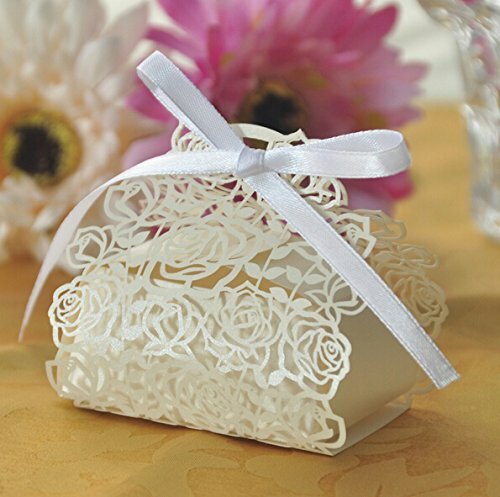 These elegant favor boxes are perfect for holding little goodies you wish to bestow on guests for special occasions. WHAT YOU GET: Each box measures 4"x4"x2". Box could hold up to 0.5 lb. Each 1 x quantity is for 100 total boxes. These favor boxes are shipped flat. Simple folding is required for assembly. 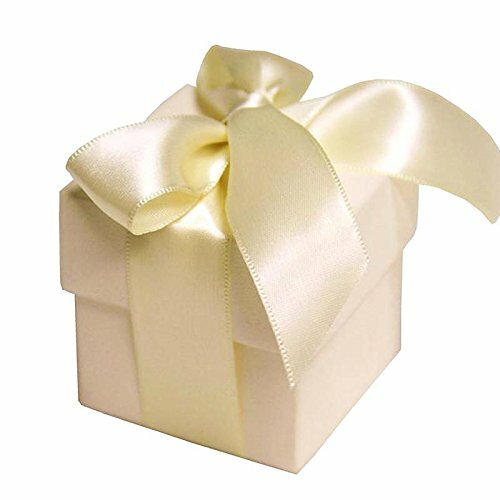 Ribbon and other decorations are not included with this purchase.The boxes packed by 100 and unfortunately we do not sell them in any lesser quantities than that.The decorating possibilities are endless. Top them off with colored ribbon or affix with personalized labels, stickers, or charms. Its classic design allows you to present your charming favors with grace. 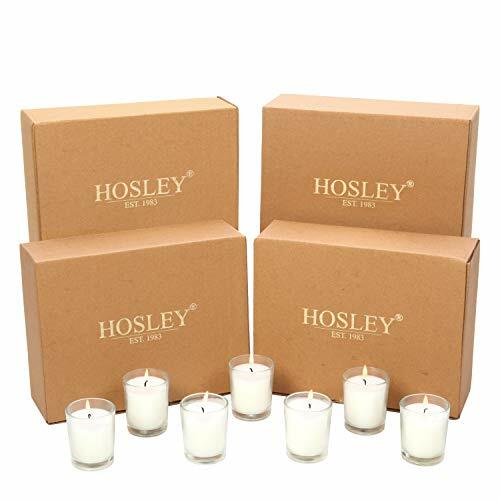 Favor boxes are perfect for favors and bring a decorative touch to any place setting or favor table at any event, party, or trade shows. You can also use them to give out to your guests as take home cake box. 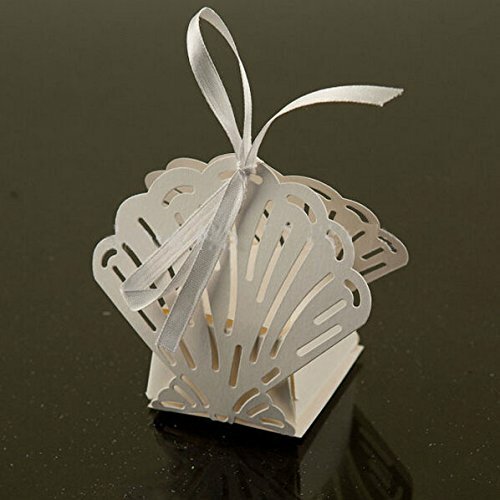 Ivory favor boxes feature an embossed pearl design and a scalloped edge. Ivory satin ribbon included. 25 boxes per package, each box measures 3-Inch by 1.875-Inch by 3-1/4-Inch. 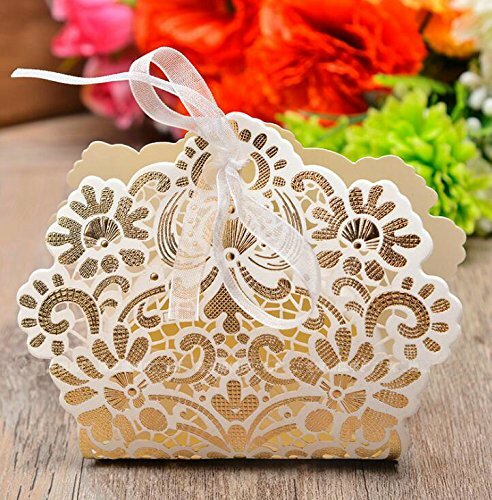 100% brand new and high quality Laser cut design, elegant With simple and good-looking color Ideal for wedding party decoration No more hesitation, buy with confidence! Note: Due to the difference between different monitors, the picture may not reflect the actual color of the item. Thank you! 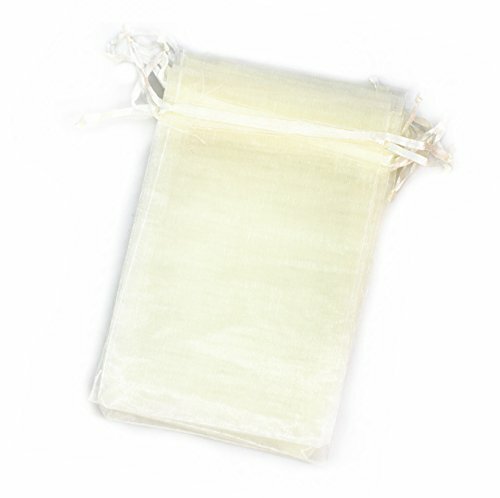 This organza bag is a gorgeous item using in wedding and other celebration occasions. 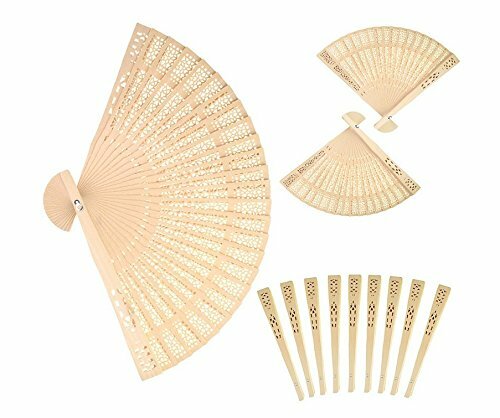 These silk foldable hand held fans, great for keeping your guests cool in warmer weather. Looks great at weddings and birthday parties alike, and your guests will surely appreciate them! IMPORTANT NOT: Send us your names and date by an Amazon message before you place order. 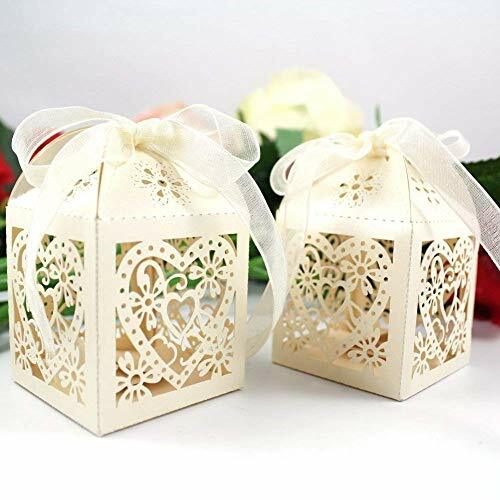 Material: Kraft PaperCondition: Brand NewSize: 13cm x 9cm x 3.5cm (5"x 3.5"x1.4")Quantity: 50pcs Boxes Only,Not Include Any String Or Ribbons!These high quality favor boxes are perfect for any occasions. Fill each with candy,mints or any special goodies you would like to present to the guests. Send your guests home with a memory or a treat in a box created specially for the occasion. 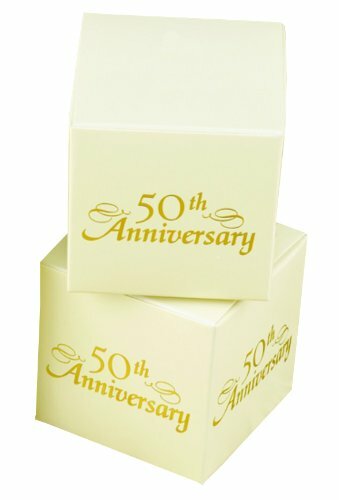 Ivory colored favor boxes have the words 50th Anniversary in gold foil on four sides. Boxes are 2-inches square. Your anniversary deserves the best - and the best comes from Hortense B. Hewitt, the leader in quality wedding and celebration accessories for more than 60 years. The history of Hortense B. Hewitt's excellence dates back 60 years. In the early 1940's, company founder Hortense B. Hewitt was at work in her New York apartment perfecting glamour garters the original line of Hortense B. Hewitt products. After experiencing much success, Hewitt opened a showroom and set out to "clothe the feminine leg". Her claim to fame was sewing garters for the young Queen Elizabeth and her wedding party. With insight and initiative, Hortense B. Hewitt was influential in the development of the wedding industry as it is today. With this fascinating legacy as its backbone, Hortense B. Hewitt Co. has become renowned for its extensive line of wedding accessories and gifts. Hortense B. Hewitt is characterized by fine fabrics, exceptional quality, competitive prices and breathtaking style. This item is a pack of 50pcs candy boxes, which are made of durable art paper. Adpots hollow artcraft and decorated with butterfly and bowknot ribbon. 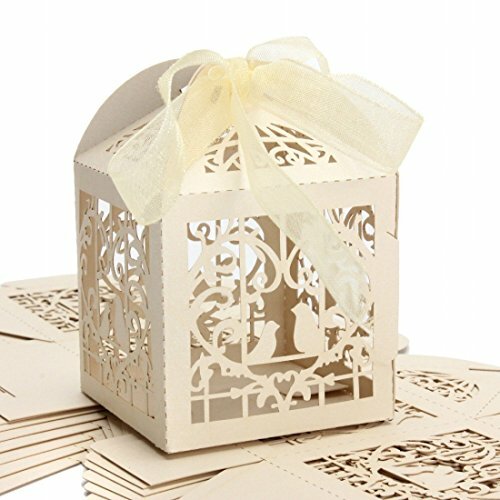 These high quality favor boxes are perfect for any occasio. Fill each with candy, mints or any special goodies you would like to present to the guests. 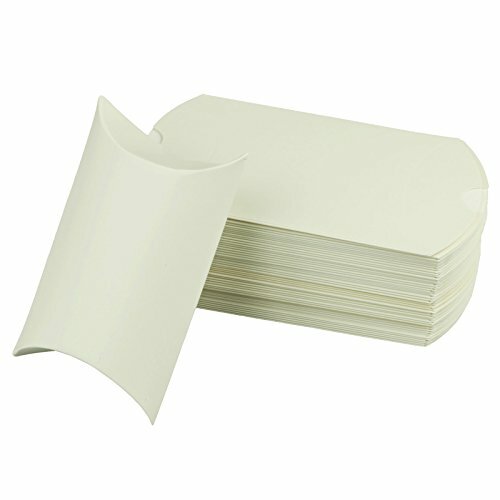 Material: durable art paper. 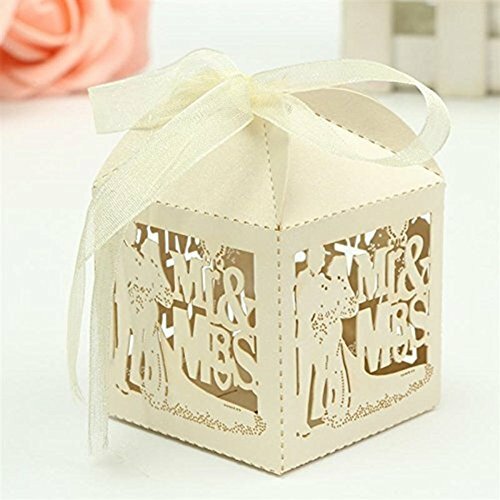 Material: PaperCondition: Brand NewSize: 9cm x 6.5cm x 2.4cm (3.5"x2.5"x0.9")Thickness: 0.25mmQuantity: 100pcs Boxes Only,Not Include Any String Or Ribbons!These high quality favor boxes are perfect for any occasions. Fill each with candy,mints or any special goodies you would like to present to the guests. Item specifics: Dimension: 5 x 5 x 7.5 cm / 2 x 2 x 3 inch (L x W x H) Material: Pearlescent Paper Pattern: Laser CutPacking List: 50 x Paper Boxes with RibbonNote: Boxes is flat when arrived and some assembly is required. Fold and open easily. 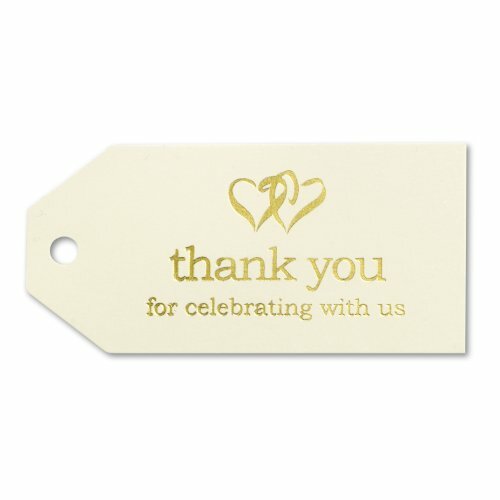 Feature: Create unique themed favors for your party guests. Fill the favor boxes with your favorite cookies, chocolate and other sweet treats! Boxes can be decorated with colorful ribbon to finish off any party decoration. Only the white colour box has slight burnt edge due to the heat in laser cutting,but it doesn't affect the overall outlook. If this is unacceptable, please contact us before purchasing. 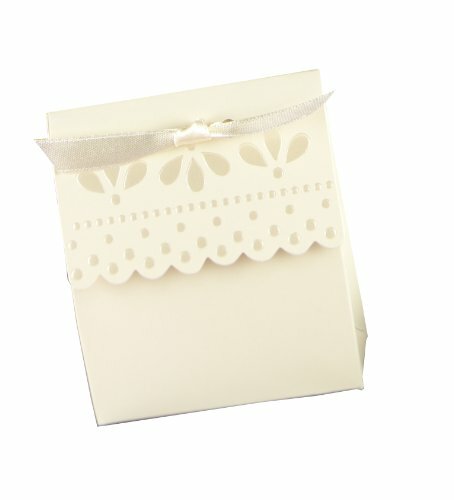 Fashionable 3"x3"x3" Favor Boxes with Tuck Top.Each 1 x qty is for 100 total boxes.Ribbon not included. Boxes are made from heavy cardstock and are shipped flat. Simple folding is required for assembly.Tuck top favor boxes feature an appealing linen-textured look. The decorating possibilities are endless. Top them off with colored ribbon or affix with personalized labels, stickers, or charms.Glossy boxes are perfect for favors and bring a decorative touch to any place setting or favor table at any event, party, or trade shows.PLEASE NOTE: The colors of products when viewed on your computer monitor may appear different than the actual color of the merchandise. 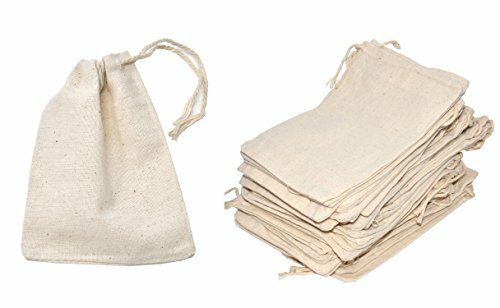 We make every attempt to give you a good representation of the available colors for each product sold, but unfortunately we cannot guarantee an exact match. Dye lot variance of 1 to 2 shades is considered normal. 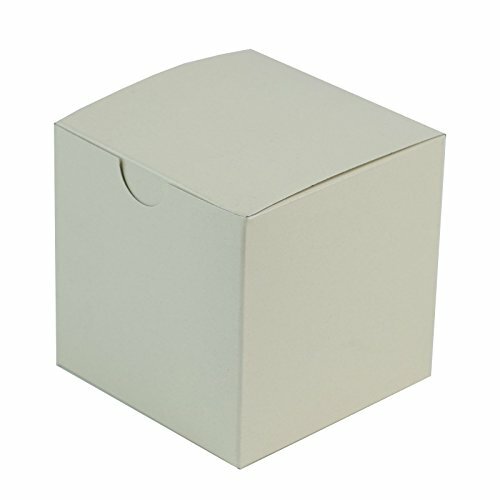 These high quality favor boxes are perfect for any occasions. Fill each with candy, mints or any special goodies you would like to present to the guests. 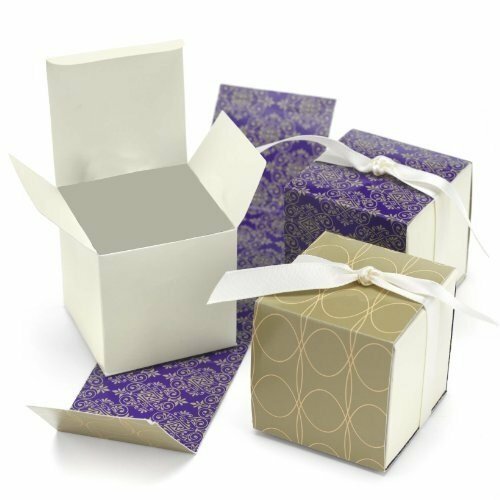 Ivory favor boxes and reversible wraps with purple damask or taupe geometric pattern. Ivory 3⁄8 inch pre-cut, satin ribbon included. Contents not included. Package of 25. Each bride is unique and the key to finding everything she wants is an extensive selection with options to coordinate. Take a look at what Hortense B. Hewitt has to offer and you won't be disappointed. 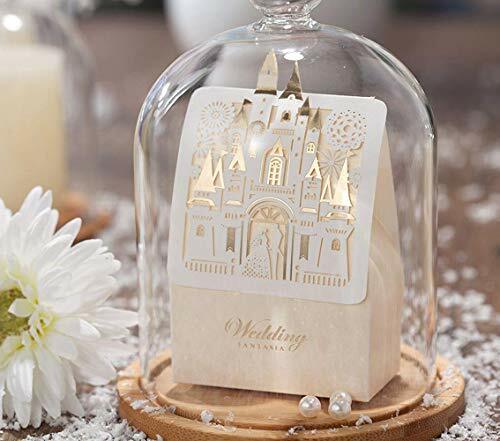 With more than 60 years experience making weddings special, HBH has thousands of beautiful wedding day accessories, bridal shower musts, fun wedding favors, bachelorette party novelties and anniversary mementos. Packing List： 1. 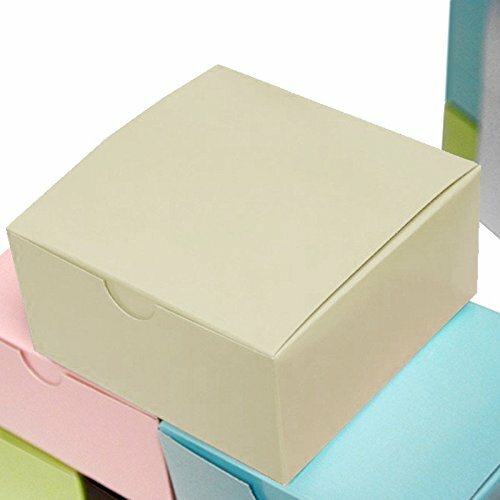 50pcs Pineapple Favors Boxes Feature: 1.A creative and conventient gifts favors box, make everyone recalls the happy moments together 2.Suitable for a variety of ocassion: wedding, bridal shower party, baby shower, birthday party Description： AerWo is a proffessional supplier for party decorations in Amazon. ❤Where There is Amazing Party, There Are Always Starting From AerWo. ❤We Specialize in Providing Perfect Service for Party, such as Wedding, Baby shower, Bridal shower, Bachelorette party and Halloween. ❤Our Goal is to Just Make Things Better. ❤Share Our Service with You, Share Your Praise with Us. ❤Integrity * Quality * Responsibility * Guarantee. 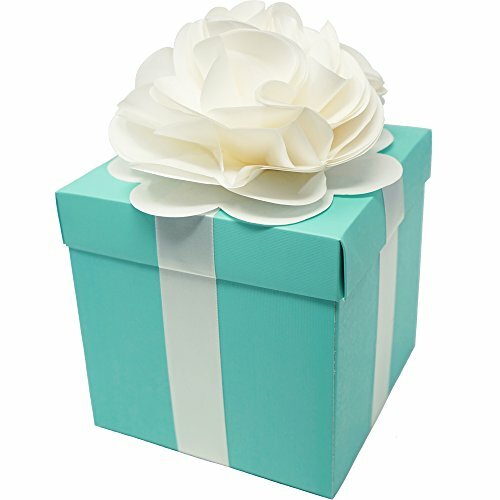 Wow your guests with the Robin Egg Blue centerpiece box - perfect for weddings and themed parties. You can even store a hidden gift item inside the box as a surprise! Each package comes with 1 unassembled centerpiece box with lid, 2 long strips of self adhesive satin ribbon (for bottom half of box), 2 short strips of self adhesive satin ribbon (for top half of the box), and 1 self adhesive unassembled tissue paper flower to place on top of the centerpiece. 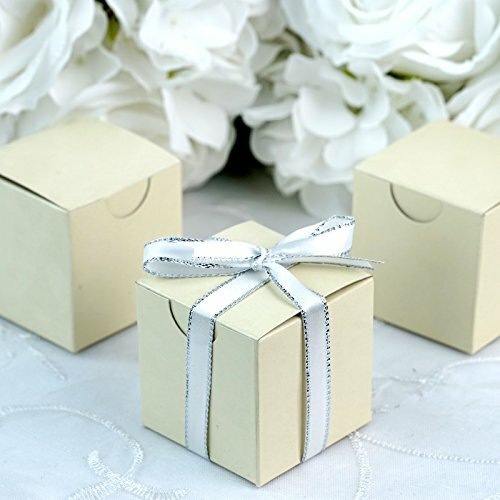 WHAT YOU GET:Each 1 x quantity is for 50 total boxes.Decorative Favor Box edges are easy to fold, items come in flat. The decorating possibilities are endless. 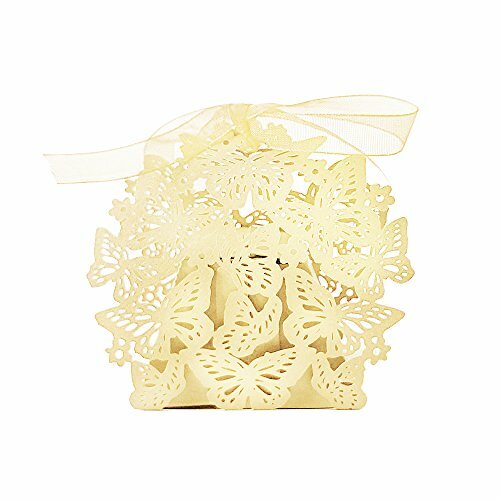 Favor boxes are perfect for favors and bring a decorative touch to any place setting or favor table at any event, party, or trade shows. 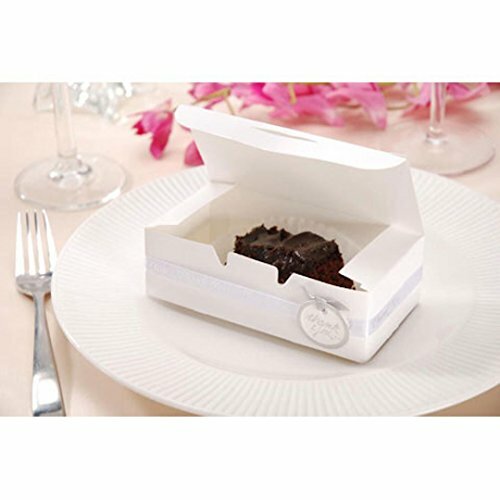 You can also use them to give out to your guests as take home cake box. PLEASE NOTE: The colors of products when viewed on your computer monitor may appear different than the actual color of the merchandise. We make every attempt to give you a good representation of the available colors for each product sold, but unfortunately we cannot guarantee an exact match. Dye lot variance of 1 to 2 shades is considered normal. Glossy fold-up boxes. 3x3x3 cake size. 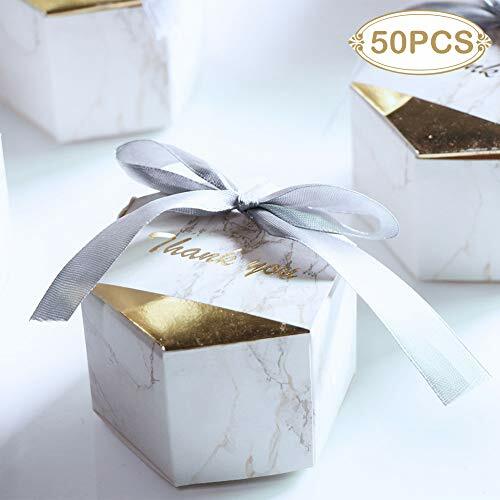 pack of 100 Delicate Favor Boxes with Glossy Outside Finish Measures: 3" x 3" x 3" Fill with your favorite candy to make a cute surprise box for your guests. Item is for the boxes only, does not include ribbons or other decorations on picture. Boxes are shipped flat. 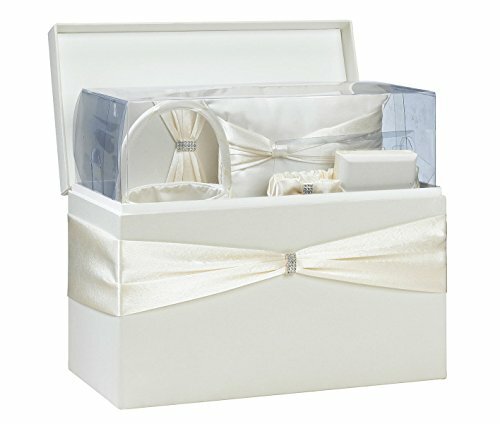 Lillian Rose Ivory Sash Wedding In A 13.5"x7"x8.5" Card Box. 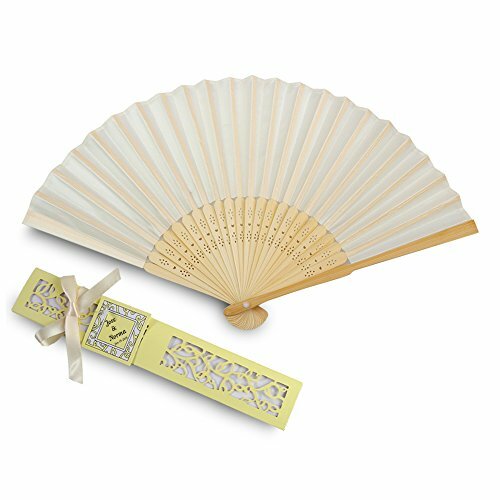 This ivory satin wedding set includes six wedding accessories essential to completing your perfect day. 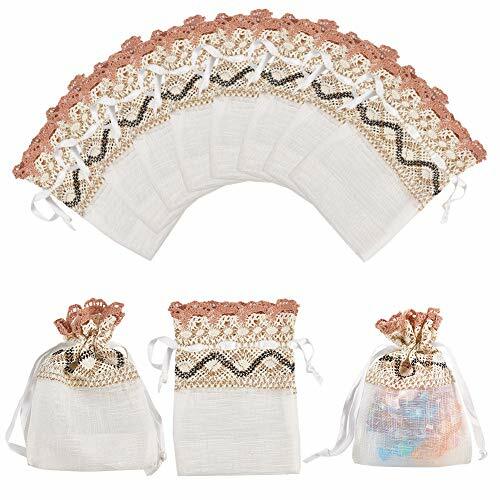 Included are the following items: one 10" x 6.5" guest book, one 3.25" x 5.25" pen set, one 7.5" ring pillow, one 7.5" flower basket and one garter -- all of which are packaged to fit inside the 13.5" x 7" x 8.5" card box. Most of the accessories (excluding the pillow and basket) are accented by a silver rhinestone ornament. The silver pen contains black ink. Also available in white. 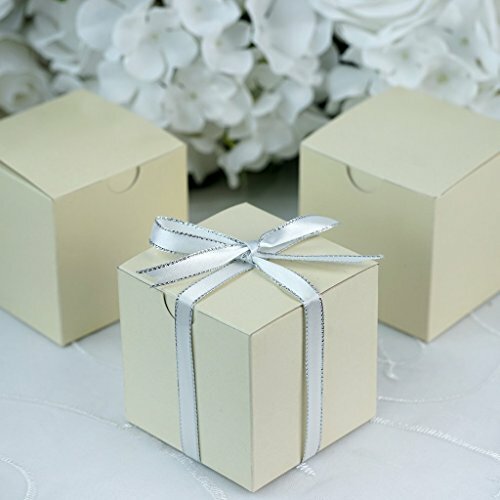 These white boxes made of sturdy thin cardboard can hold anything from a piece of wedding cake to candy favors and more! 5.5 x 1.75 inches. 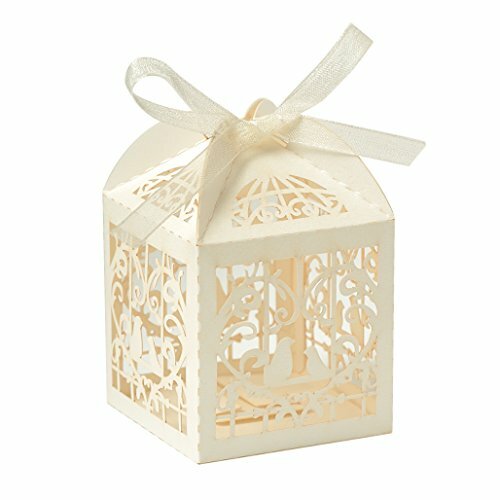 Compare prices on Ivory Wedding Favor Boxes at LiveSaler.com – use promo codes and coupons for best offers and deals. We work hard to get you amazing deals and collect all avail hot offers online and represent it in one place for the customers. Now our visitors can leverage benefits of big brands and heavy discounts available for that day and for famous brands. We try to makes comparison shopping easy with Product Reviews, Merchant Ratings, Deal Alerts & Coupons. Find Deals, Compare Prices, Read Reviews & Save Money.